Abandoned or postponed—either way, this is a major victory for the New Mexico anti–nuclear activists and community members who have been fighting this issue since 2003. So far the news has mostly escaped the radars of the national mainstream and progressive media—I found one Associated Press article, and few articles in the New Mexico newspapers. But this story has local, regional and national significance, so I’ll share a bit more with you. In New Mexico, the two national labs—Los Alamos and Sandia wield a lot of power as they bring in a lot of money into the state—to develop among other things weapons of mass destruction. These projects are usually justified with a simple argument—in the interest of National Security—the U.S. sacred cow. It isn’t easy for an elected official—state or federal to oppose a major weapons project at one of these labs. The Albuquerque Journal Editorial Board was quick to express their displeasure with President’s decision and blamed it on the mismanagement at the lab, “New Mexico’s Sen. Jeff Bingaman, who chairs the committee, noted that ‘for years we have been told the CMRR nuclear facility was necessary...’ although he stopped short of condemning the DOE for essentially pulling the plug and shifting the money to the Uranium Processing Facility at Oak Ridge, Tenn. ...But if it wants to get ahead in the funding game—and regain value in the eyes of the administration—mistrust between the labs and with the NNSA [National Nuclear Security Administration], operational inefficiencies and a draconian management culture must be fixed.” Let’s take a closer look. We’re always so inundated with bad news and sad news that we rarely take the time and look back, when we do win, most importantly at the things that got us there, however fleeting that win might be. In activism there is no win however, only ongoing engagement, as environmental activist David Brower once famously articulated, “Conservationists have to win again and again and again; the enemy only has to win once.” That aside, for now, what can the New Mexico activists tell us about how they stopped what they call, a Plutonium Bomb Factory. Here is their story. 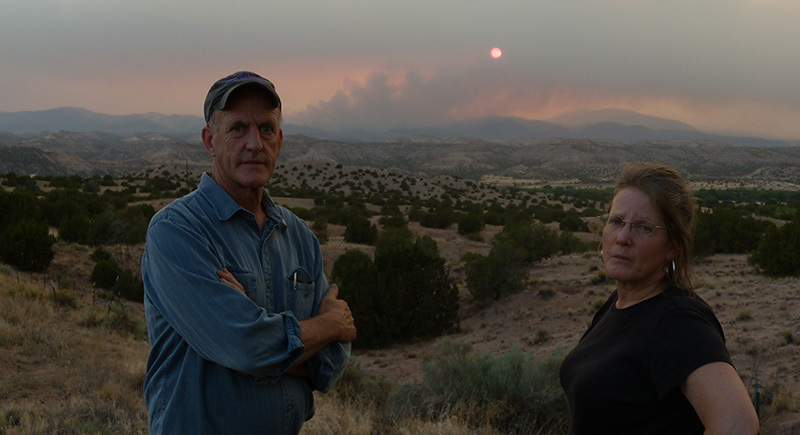 Joni Arends and David Bacon with smoke from the Las Conchas Fire in the background (Photo by Subhankar Banerjee). Note for readers: I’d like to thank Joni Arends and Robert Gilkeson for their help with this story. Subhankar Banerjee is founder of ClimateStoryTellers.org, and a leading voice on issues of arctic conservation, resource wars, indigenous human rights, and climate change. He recently completed editing an anthology titled, Arctic Voices: Resistance at the Tipping Point (New York: Seven Stories Press, June 19, 2012). His arctic photographs will be shown this year at the 18th Biennale of Sydney: all our relations. Subhankar is currently a Distinguished Visiting Professor at Fordham University in New York.